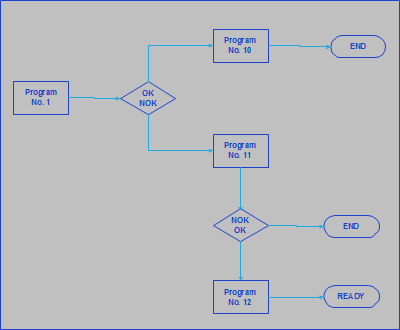 As a function of test result can be branched out at the end of a test program on other test programs. This makes sense, e.g. when with different test pressures should be checked. If with a data binding about our SDI telegrams is worked, max. 10 programs can be chained. At the end of the whole cycle the single results can be called away by the device. Outwardly the device behaves for the cycle duration in such a way, as if a whole cycle runs off.